Station Hintereis (ST-HE) near Hintereisferner (HEF) in the catchment of Rofen Valley (ROF). 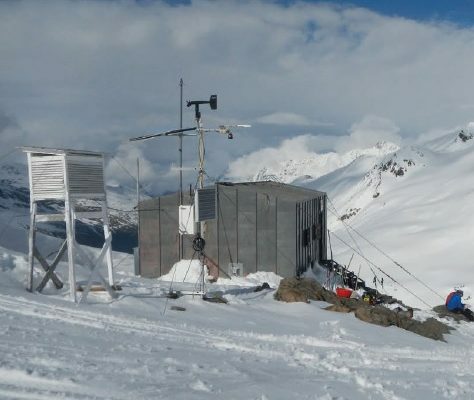 Institute for Atmospheric and Cryospheric Sciences ACINN, University of Innsbruck has, by contract, the legal and actual power of disposition of the station hut, which is built on ground owned by the Austrian Governmental Forestry Administration. The ST-HE is in 200 m distance from the 1970s mean equilibrium line of HEF, an approximately 7 km2 valley glacier. HEF is one of several glaciers in the high Alpine catchment of Rofenache (Rofen river), Ötztal Alps, Austria, on the border to Italy. Protected area: http://www.naturpark-oetztal.at/en/nature-culture/protected-areas/ruhegebiet-oetztal-alps.html; scientific reference area: one of the longest glacierA glacier is a large, persistent body of land-based ice that forms over many years where the accumulation of snow is greater than its loss (ablation). The ice in a... More mass balanceThe difference between the amount of ice a glacier gains in winter and the amount lost in summer. A glacier which is gaining mass has a positive mass balance: more ice is... More records worldwide (since 1953 without interruptions); www.wgms.ch. The location is in a high Alpine mountain environment. HEF is a valley glacier located in the inner Ötztal Alps, Austria. ST-HE is totally surrounded by alpine glaciers covering peaks as high as almost 3800 m asl. The immediate surroundings of the HEF are characterized by freshly exposed rocks and debris resulting from ongoing glacier shrinkage. Huge LIA moraines dominate the surroundings of the glacier tongue. On the high mountain meadows somewhat below the glacier and extending down to the timberline sheep pasture during summer months. Due to its high elevation and somehow difficult access, ST-HE is not suitable for studying the lower areas of the ROF. Main focus is on glaciologyThe study of glaciers. and atmospheric studies. HEF is mentioned in 1601 for the first time and then in 1678, 1774, 1770, 1816 in the context of a proglacial lake formation and related GLOFs. Glacier length observations began in 1847 and earliest maps are from 1870, 1888 and 1893, followed by a long series of maps. Research was intensified since the International Geophysical Year and during the International Hydrologica Decade/Program of UNESCI/IHP. HEF is the key research site for glaciological studies at IMGI since then. In 1966, ST-HE was build for logistic support. It is self-supplied and can accommodate max. 8 persons in bunk beds. There is no electricity but gas for cooking, heating and illuminating. HEF has one of the longest change records on Earth, based on series of geodetic maps starting in the 19th century. Since 2001 one to two airborne LIDAR surveys are carried out per year for determining the ice volume changes. Length changes are measured annually since 1847, a mass balance series dates back to 1953. Complementary studies of ice-atmopshere interaction, ice dynamics, and glacier hydrologyThe study of water in the environment, particularly its amount, movement and quality. It encompasses water in rivers, lakes, glaciers, soil and underground aquifers. The way in which water (liquid and... More accumulated rich data sets. Situated near the main Alpine water divide (= also the Austria/Italy border) two all year round settlements have to be mentioned: Vent (AUT), 15 km from ST-HE, 150 permanent inhabitants, alpine farming and (“soft”) tourism. Kurzras/Maso Corto, Schnals/Senales (ITA), approx. 10 permanent inhabitants but all year round glacier ski tourism. Skiing infrastructure up to 3200 m asl. From Innsbruck (airport) (i) by car (2h) or train/bus (4h) to Vent, 5-6 h walk (Hochjoch Hospiz mountain hut half way), helicopter transport possible but expensive) [from 1900 – 3000 m asl]; (ii) by car (3h) or train/bus (5-6h) to Kurzras (ITA), cable car and ski lifts, then walk 3-4 h [3200 – 2800 – 3200 – 3000 m asl].